The following appeared in the tiny booklet "The First 100 Years", East Liverpool Centennial Celebration, October 11 to 14, 1934. The booklet was Printed by the Simms Printing Co. 211-213 Market Street, East Liverpool, Ohio. The Booklet was found in the basement of a home recently. 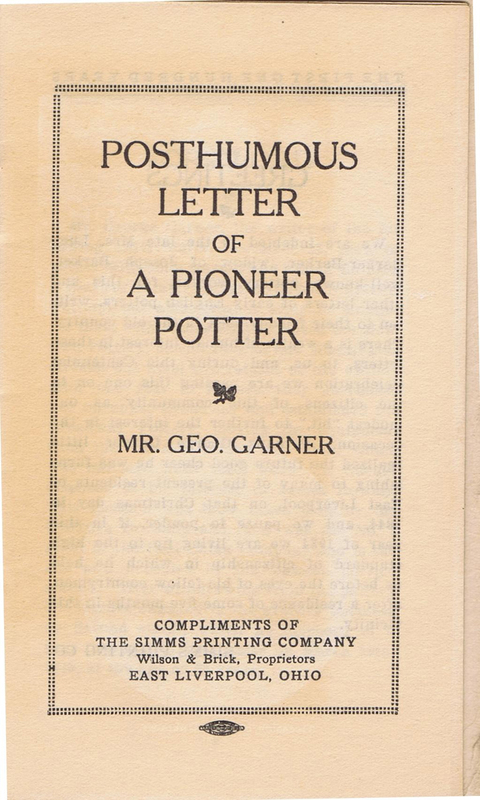 We are indebted to the late Mrs. Lucy Garner-Barker, widow of Joseph Barker, well-known pottery worker, for this and other letters of early English potters, written to their friends back in the old country. There is a wealth of human interest in these letters, to us, and during this Centennial Celebration we are passing this one on to the citizens of this community as our modest "bit," to further the interest in the occasion. Perhaps George Garner little realized the future good cheer he was furnishing to many of the present residents of East Liverpool, on that Christmas day in 1844, and we pause to ponder, if in this year of 1934 we are living up to the high standard of citizenship in which he held Us before the eyes of his fellow countrymen, after a residence of some five months in this vicinity. SIMMS PRINTING CO.
Mr. George Garner, the writer of the following letter, dated December 25, 1844, together with John Garner and Enoch Bullock, a years or so later operated the old Wellsville Pottery, but abandoned it after 18 months, He then, with James Foster, leased the Mansion Pottery, corner Second and Washington streets, but upon the refusal of the owners after one year to release, they purchased lots on upper Broadway and established the Broadway Pottery, moving the equipment from the Mansion to the new plant which was operated until 1860, when Mr. Garner disposed of his interest to James Rowley. This location was later taken over by the Goodwin Brothers and later was the No. 2 plant of the Hall China Company and is the site now occupied by the Dawson service station. 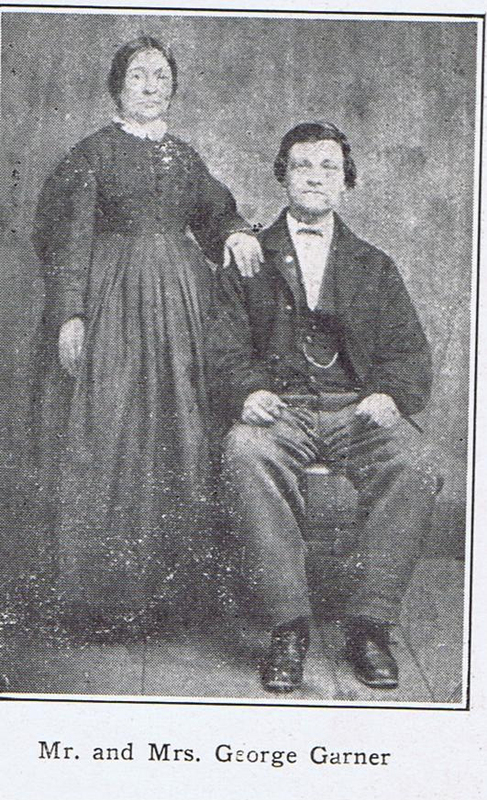 After withdrawing from the pottery Mr. Garner engaged in the grocery business on Second street, which he disposed of a year previous to his demise on March 28th, 1879, at the age of 63 years. North America, Dec. 25th, 1844. Respected Friends: I have delayed writing, in order to give you every information, respecting the state of this country. The past events on the water, and, also, in getting up the country, I have stated in a letter to my brother, of which no doubt you have heard. But, however, I will say this much, we had what is called a good passage with a good captain and an intelligent crew. We landed in New York on the 3d of August, your wake's Saturday. Howson landed about the 1st or 2d, I cannot say which. He set sail a fortnight before us; so you see, we beat them about thirteen days. Our passage was thirty-five days. We called at New Jersey. We also called at the house of Sampson Chatterly's relation in Jersey, I mean one of the Marshes; but he was gone to a funeral, and we did not see him. I am informed that Daniel Greatbatch is living in a very respectable way, and doing well. We set out again on the 5th, by steamboat, railway and canal; and got to our journey's end on the 15th; a distance of 500 miles. We were well received at East Liverpool, by a many that came from the Potteries, together with others from Ashley wholds. In three days after we got in, Bradshaw, Cartwright, and myself began to work. Cartwright was turning after me; and Bradshaw began in the kiln, at John Goodwin's John Goodwin wanted me to take a share with him, in the business, but I declined. I told him, I did not intend to go into business until spring. By that time, I shall know a little more of the country. It would be unwise of me to commence in business, as soon as I got in. There are those that have and have lost their money to teach them sense. If on the land, they give more for it than they would do, by waiting until opportunity serves, for, in farming, the situation is a great deal better. If it lies within 20 or 30 miles of a town it is a deal better than being situated 200 or 800 miles off, because the produce can be taken in the market with little expense, and a demand of cash be made for it. But I feel more favourable to the potting business, and have determined to enter into business in the spring. And, in order to gain information respecting the sale of ware, I have been through Pittsburgh and the surrounding markets, and I find there are markets open to receive every cup of ware that is made. The Derbyshire ware cannot come into these markets, under one dollar per dozen, that is unhandled ware, handled a deal higher. Now there can be as good a body as your citron body got up here, and sold for 30 per cent less than the Derbyshire. This you may easily infer, because there is a duty of 30 per cent. on your English pottery. This, with breakage, makes it higher. I have seen, in one of the respectable houses, in Pittsburgh, white cream colored dishes sold at six dollars per dozen. Now there can be good yellow ware dishes got up here, and sold at 70 cents per dozen —2s. 4d. your money. East Liverpool is full of clay and coal, and contains about 760 inhabitants, lying on the Ohio river, 45 miles from Pittsburgh. It lies well for shipping to Cincinnati, also New Orleans, and a many other markets. I have engaged with the Bennetts, that were potting here, to do their throwing until spring. Cartwright has engaged with them also, to turn for them. They, together with us, are leaving East Liverpool, and going to Birmingham. The Ben- netts have built a factory, to the amount of $4,000 dollars, which is now in operation at Birmingham. I shall have a good situation. I will not recommend any potters to come out, unless they have situations to come to; but as the trade spreads, potters will be wanted. But there are none wanted at present. If any potters come here, they will be in each other's way; and give the masters an opportunity of reducing wages. But if any of you wish to come out, by writing to me, I will answer your interrogations to the best of my knowledge and ability. I would recommend George Hudson to come out and go on the land. He could not fail to do well, for, by understanding farming a little he may rent a farm, by paying half the farm produces, by way of rent; the landlord finding everything that is necessary for the working of the farm. This being done, you can produce more of the necessaries of life in three days than you can at the wedging block in six; and keep your wife at home, in the bargain. To work here as you do would be considered, by the Americans, as being worse than the beasts, and so having very little more sense for so doing. The women, here, never work at all; they consider it too mean; but walk around with a veil before their face, and are considered almost angels. It is impossible for you to starve. I have never seen but one beggar since we landed in America, and that was an Englishman. I saw him relieved in a very handsome way. Provisions are very cheap; the best cuts of beef 2c1. per lb. ; other parts 1d. per lb. I have bought my winter's potatoes in at 15c per measure. In East Liverpool they are selling at 121hc per measure, 1s, 2d. per peck, your money. Sugar 4d. per lb. ; butter 5d. per lb. ; tea 2s. ld. per lb. ; cheese 3d. per lb. ; flour is rising a little; it is considered now dear at $4 for 196 lbs., about 1s. 2d. per stone your money. Fruits of all kinds abound, when in season. Shoes are cheap as with you, but the leather not so good. Woolen cloth is cheap and as good as with you. I can have a good coat for $13; prints and white calicos are a little higher. There is none of that lordlyship as in England. Some of you are obliged to worship your masters, when meeting them on the road; I mean by almost ploughing the road up, with bowing and scraping to them; and perhaps just at the entrance of a place of worship. There is no such thing here. I have seen men worth double the amount of those you idolize, working side by side of their men, during the week and, on a Sunday, sitting by their side in a place of worship. The fine coat is thought no more of than the rough one, if he be a man of moral habits and character. Respecting the laws of America, they are not so constructed as in England. The poor man has a voice as well as the rich. Each State has its own laws independent of each other, from the governor down to the constable. There has been, since we came, a general election, from the President of the United States down to the magistrates of the different respective states. Mr. Polk is come out on the democratic interest, and Mr. Clay on the wig interest, for President of the United States, the democratic candidate is elected. Every man, woman and child seems to be interested in the matter. At almost every door there, is a pole erected, with a flag on the top and the President's name on for which they are in favor. They are very intelligent people. I have seen boys of 10 or 12 years old conversing with grown up men, and contending as strongly as though they had had fifty years' experience as politicians; and those at age to vote, at the day of polling, go to the ballot-box with determined step, in spite of all opposition, to exercise their opinion. There is no canvasing of votes, through the medium of some influential manufacturers. No such thing. This would not be appreciated by them; they would tell you that that liberty fought for by Washington is cherished by them, and cannot be violated. Mr. Clowes told me, before I started, that the laws of America were of such nature that a man was in great danger of being insulted on the street, and could not seek redress. I can tell him it is false. The laws of Ohio are, that if one man strikes another, he is fined $5; for playing cards, if it be in a private house, $5; for betting wagers, if it be on the election $50; or lose his vote forever; and all other kinds of gambling is punished in a similar way. The State of Virginia is a slave State, where the colored people are bought and sold. In that State the laws are not quite so severe on gambling; but assaults of all kinds are punished with the greatest severity. The State of Pennsylvania is about the same as Ohio, and all other free states are almost as severe. There are no stipendiary magistrate here; they are elected by the voice of the people, There has been an election in the village of East Liverpool for their magistrate; they solicited a shoemaker to stand the poll, but he objected. A neighboring farmer then came forward, and was defeated by a man of good character and necessary education for the office. Cartwright's latheturner is the son of a magistrate; his father is nothing but a tailor; but having character that bears the strictest investigation he is elected. Just so with other offices of the State. The people seem to be alive to their own interest. The rising generation are better educated than with you. The parent keeps the child steadily to his books; and when old enough places in his hands the newspaper, which prepares his mind for every coming event; and, when young, will converse with men on the state of the country, pointing out the evil, and also the remedy, in such a manner that would surprise you. I think I have now named everything of importance. We are all in good health, and sincerely hope this will find you in possession of same. N. B.—If you write, direct for me, "Birmingham, near Pittsburgh, Allegheny County, State of Pennsylvania, North America." Please to tell my brother John, and brother- in-law, Enoch Bullock, that I received their letters about a fortnight after I wrote my last, and will answer in about a week. G.G.